SOCHI, Russia (AP) Neymar limped out of Brazil’s training session at the World Cup on Tuesday because of pain in his right ankle. The Brazilian soccer confederation said the injury was not serious, adding Neymar left as a precaution and would be back in training on Wednesday. The federation said Neymar has been in pain since the team’s 1-1 draw against Switzerland on Friday, when he was consistently fouled. Neymar started practicing with the rest of the squad but left accompanied by a doctor about 30 minutes into the session in Sochi. He had been playing keep-away with a few other players when he started showing signs of discomfort in his ankle. He was visibly in pain after he tried to intercept a ball with his right foot while at the center of the keep-away circle. At one point, he bent down and grabbed his ankle, but tried to continue playing anyway. A few moments later he finally decided to leave, kicking a ball away with his left foot before limping away beside the team doctor. Rodrigues said Neymar would continue his recovery process but was set to practice normally on Wednesday, two days before the team’s match against Costa Rica in St. Petersburg. Brazil and Switzerland are two points behind group leader Serbia, which defeated Costa Rica 1-0 in its opener. Neymar had already practiced separately from his teammates on Monday. Rodrigues said the pain Neymar felt Tuesday was not in the same place where he injured his foot earlier this year. Neymar was sidelined for about three months because of the injury and was not fully fit when he arrived in Russia for the World Cup. Heavily marked and far from his best, Neymar was fouled 10 times in the match against Switzerland in Rostov-on-Don. He was limping when he talked to reporters after the match, when doctors dismissed anything serious. 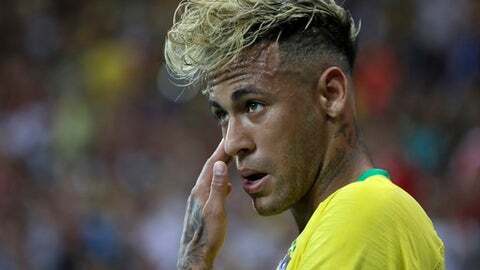 Brazil coach Tite said before the tournament started that Neymar wouldn’t likely be in his best form until the third match of the group stage.